The Battle of Horseshoe Bend was fought March 27, 1814, during the Creek War (1813-1814). Inspired by the actions of the Shawnee leader Tecumseh, the Upper Creek elected to side with the British during the War of 1812 and commenced attacks on American settlements. 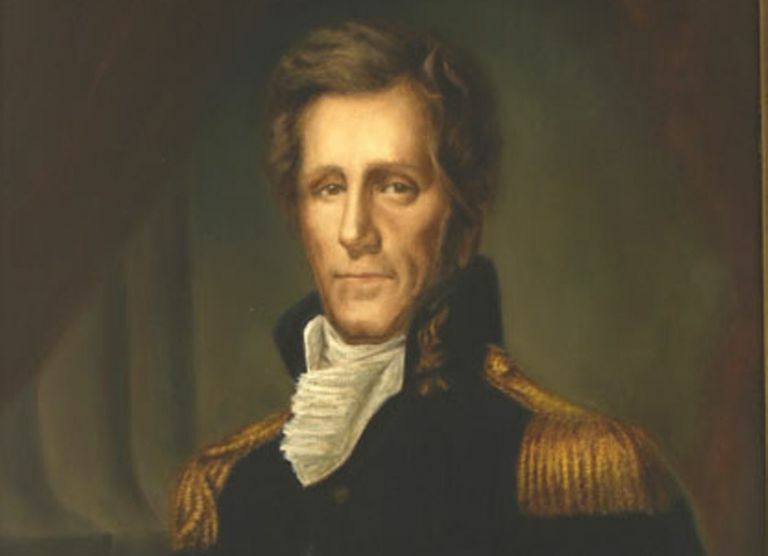 Responding, Major General Andrew Jackson moved against the Upper Creek base at Horseshoe Bend in eastern Alabama with a mix of militia and regular troops. Attacking on March 27, 1814, his men overwhelmed the defenders and broke the back of the Upper Creek's resistance. A short time later, the Upper Creek asked for peace which was granted through the Treaty of Fort Jackson. With the United States and Britain engaged in the War of 1812, the Upper Creek elected to join with the British in 1813 and began attacks on American settlements in the southeast. This decision was based on the actions of the Shawnee leader Tecumseh who had visited the area in 1811 calling for a Native American confederacy, intrigues from the Spanish in Florida, as well as resentment about encroaching American settlers. Known as the Red Sticks, mostly likely due to their red-painted war clubs, the Upper Creeks successfully attacked and massacred the garrison of Fort Mims, just north of Mobile, AL, on August 30. Early American campaigns against the Red Sticks met with moderate success that fall but failed to eliminate the threat. One of these thrusts was led by Major General Andrew Jackson of Tennessee and saw him push south along the Coosa River. Reinforced in early March 1814, Jackson's command included a mix of Tennessee militia, the 39th US Infantry, as well as allied Cherokee and Lower Creek warriors. Alerted to the presence of a large Red Stick camp at the Horseshoe Bend of the Tallapoosa River, Jackson began moving his forces to strike. 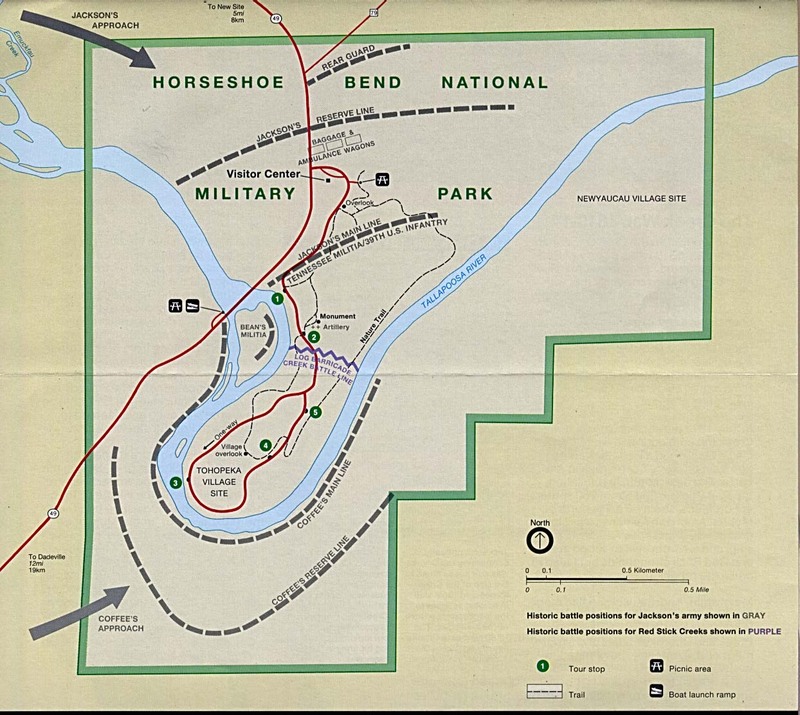 The Red Sticks at Horseshoe Bend were led by the respected war leader Menawa. The previous December, he had moved the inhabitants of six Upper Creek villages to the bend and built a fortified town. While a village was constructed at the southern toe of the bend, a fortified log wall was built across the neck for protection. Dubbing the encampment Tohopeka, Menawa hoped that the wall would hold off attackers or at least delay them long enough for the 350 women and children in the camp to escape across the river. To defend Tohopeka, he had around 1,000 warriors of which around a third possessed a musket or rifle. Approaching the area early on March 27, 1814, Jackson split his command and ordered Brigadier General John Coffee to take his mounted militia and the allied warriors downstream to cross the river. Once this was done, they were to march upstream and surround Tohopeka from the far bank of the Tallapoosa. From this position, they were to act as a distraction and cut off Menawa's lines of retreat. As Coffee departed, Jackson moved towards the fortified wall with the remaining 2,000 men of his command (Map). Deploying his men across the neck, Jackson opened fire with his two artillery pieces at 10:30 AM with the goal of opening a breach in the wall through which his troops could attack. Possessing only a 6-pounder and 3-pounder, the American bombardment proved ineffective. While the American guns were firing, three of Coffee's Cherokee warriors swam across the river and stole several Red Stick canoes. Returning to the south bank they began ferrying their Cherokee and Lower Creek comrades across the river to attack Tohopeka from the rear. In the process, they set fire to several buildings. Around 12:30 PM, Jackson saw smoke rising from behind the Red Stick lines. Ordering his men forward, the Americans moved towards the wall with the 39th US Infantry in the lead. In brutal fighting, the Red Sticks were pushed back from the wall. One of the first Americans over the barricade was young Lieutenant Sam Houston who was wounded in the shoulder by an arrow. Driving forward, the Red Sticks fought an increasingly desperate battle with Jackson's men attacking from the north and his Native American allies assaulting from the south. Those Red Sticks that attempted to escape across the river were cut down by Coffee's men. Fighting in the camp raged through the day as Menawa's men attempted to make a final stand. With darkness falling the battle came to an end. Though severely wounded, Menawa and around 200 of his men were able to escape the field and sought refuge with the Seminoles in Florida. In the fighting, 557 Red Sticks were killed defending the encampment, while approximately 300 more were killed by Coffee's men while attempting to escape across the Tallapoosa. The 350 women and children in Tohopeka became prisoners of the Lower Creek and Cherokees. American losses numbered 47 killed and 159 wounded, while Jackson's Native American allies incurred 23 killed and 47 wounded. Having broken the back of the Red Sticks, Jackson moved south and built Fort Jackson at the confluence of the Coosa and Tallapoosa in the heart of the Red Stick's holy ground. From this position, he sent out the word to the remaining Red Stick forces that they were to sever their ties to the British and Spanish or risk being wiped out. Understanding his people to be defeated, noted Red Stick leader William Weatherford (Red Eagle) came to Fort Jackson and asked for peace. This was concluded by the Treaty of Fort Jackson on August 9, 1814, by which the Creek ceded 23 million acres of land in present-day Alabama and Georgia to the United States. For his success against the Red Sticks, Jackson was made a major general in the US Army and achieved further glory the following January at the Battle of New Orleans.